Our passion is centered on relationships. We have a passion to teach people who they really are! –what their “true identity” in Christ is! We are passionate to help missionaries and churches to be all Jesus wants them to be. We have a desire to watch in awe, as a person surrenders their heart to Christ and then be honored to be present as they learn the “Abundant Life” as Jesus taught us in John 10:10! 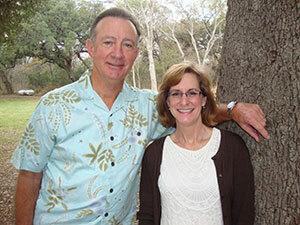 Ken and Sherry are seeing God lead struggling people out of the wilderness into the Promised Land of the Abiding Life. They are available locally to provide personal ministry and a one day seminar. 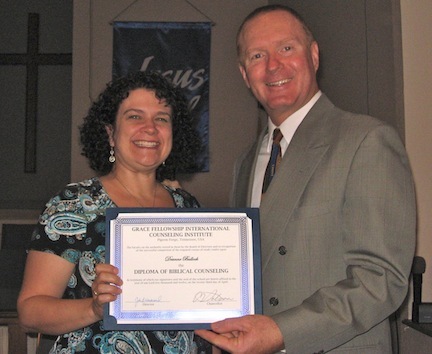 Deanna Bullock is a pastor’s wife, mom, and graduate of the GFI Counseling Institute. One way she is using what she’s learned is through her blog: http://deannebullock.com/. She also has an online/telephone counseling ministry: “eCounsel Subscription Service – counseling you can receive at any time, in any place, for as long as you need it.” Her site is titled “18 Inches Down” to address the need for a head-to-heart process of appropriating Christ as Savior, Lord, and Life. God bless your ministry, Deanne! The next Grace Fellowship Exchanged Life Conference and Workshop is scheduled for July 19,20 (Conference), and 23-25, 2013 (Workshop) in Sevierville, Tennessee. This an important opportunity for leaders and other disciplers. For details and registration, see the Events Calendar or Conference and Workshop pages, or call GFI @ 1-888-66GRACE. It will be hosted by First Baptist Church in Wears Valley (Sevierville, TN). All who desire Christ-centered discipling and equipping are welcome!